A great first ship model kit! Because of their shallow draft, flat-bottomed work boats called “flatties,” were popular around the turn of the century along the Chesapeake Bay from Virginia to North Carolina. 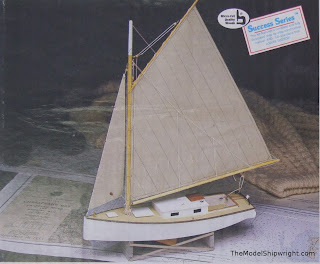 The simple lines of these boats that made them ideal for locals to build from locally-available lumber also make this an ideal ship model kit or a person with no prior wood ship model building experience. The kit comes with die-cut and pre-cut parts, as well as fittings, rigging line, sail material, and a well-done set of instructions and building plans. Follow along as we document the step-by-step ship model kit construction with plenty of photos on our Midwest Flattie Kit Build pages.